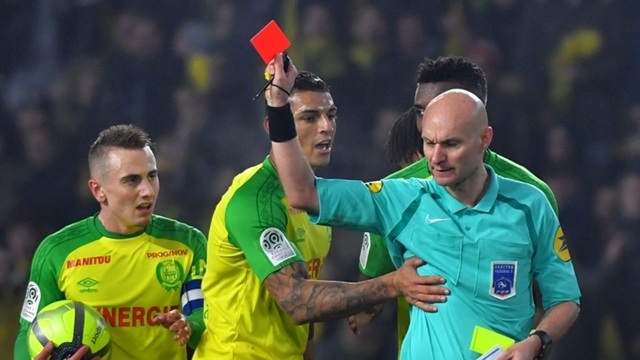 Nantes president Waldemar Kita has called for French referee Tony Chapron to be suspended for six months after he kicked out at defender Diego Carlos during the 1-0 defeat to league leaders Paris Saint-Germain (PSG) on Sunday night. The incident happened after Carlos collided with Chapron as he was running forward in support of a last-ditch Nantes counter-attack with his side trailing to an Angel Di Maria goal. Chapron fell to the turf after the collision with the Brazilian centre-back and thereafter kicked out at him as he tumbled. Chapron appeared to catch the Brazilian on the shin prompting him to protest as the official got to his feet and he was met with a second yellow card (red card) having already been booked before. While speaking with L’Equipe, Kita called the referee a gag as he called for his ban. “I received 20 SMS [messages] from all over the world telling me that this referee is a gag. “What do you want me to say to you? If I talk too much, I will be summoned by an ethics committee. We have no right to say anything. It’s scandalous to see that.” he added. “I’m waiting for the green light, otherwise I’ll be killed. It’s amateurism. “Sincerely, I think he did not do it on purpose. I do not want to believe he did it on purpose. At least, you apologise, but you do not show a red. “We still have to find a solution because there is a problem in all this. In the end, it makes me laugh – I have never seen that.” he further said. Nantes forward Valentin Rongier also told reporters that a player would face a 10-game ban if the roles of Carlos and Chapron were reversed. On the punishment that should be meted out to Chapron, Kita called for a six-month ban. “If it is us [who do it] we take six months. “He [should be] at the end of his career but that’s not how we end up.” he concluded.